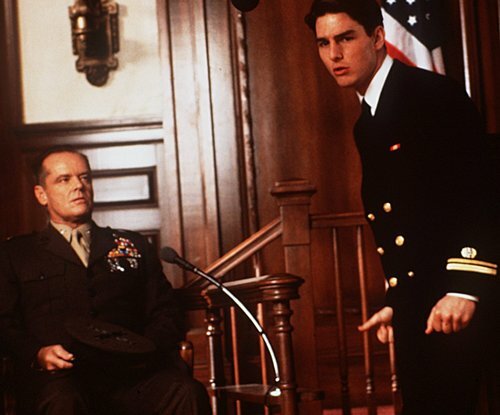 A Few Good Men is a movie which could have been better executed. The movie boasts a talented director Rob Reiner (in his pre-North years), a great screenwriter (Aaron Sorkin, who wrote The West Wing and The Social Network), and big ensemble of stars. Yet I felt something was missing in A Few Good Men: ambition. What really separated great movies from good ones is ambition. In ways it reminded me of The King’s Speech. Both are enjoyable crowd pleasers but lack sufficient energy to boost themselves to greatness. The movie starts off with a marine who is hazed by two other fellow soldiers at the Guantanamo Naval Air Station. These two are taken to Washington D.C. and tried with murdering a fellow marine. But JoAnne Galloway (Demi Moore), a naval officer and lawyer, suspects that they were ordered to do a code red (which is pretty much beating up a fellow marine for doing something wrong) and shouldn’t be charged. A case is made and naval lawyer Daniel Kaffee (Tom Cruise) is hired to defend the two. Kaffee spends much of the movie working with Galloway and fellow lawyer Sam Weinberg (Kevin Pollak) to make his case, leading up to a dramatic trial. A Few Good Men‘s greatest strength is its actors. As I said before, the movie has a pretty famous ensemble. Other than Cruise and Moore there’s also Kevin Bacon, Kiefer Sutherland, and of course Jack Nicholson. Anyone who has followed my blog long enough knows that Nicholson is one of my favorite actors and his performance is the best thing about the movie. And plus he delivers one of the most quotable lines in movie history. Unfortunately, where the movie really suffers is its over-the-top comic tone. I love the humor Sorkin puts into his works, but he added too much here. Tom Cruise’s character, in particular, acted as comic relief for 90% of the film. I couldn’t take the movie seriously most of the time because of this and seeing the subject, that’s not a good sign. The rest of the film outweighs this so I can recommend A Few Good Men. I’d be lying if I said I didn’t enjoy it. But it could have been a whole lot more and with its director and writer had the potential to unlock it. Great post, Nicholson’s line is a classic. Thanks! Jack Nicholson is one of the few actors who can deliver flawless monologues. His role is the best part of the film. I’m a fan of Aaron Sorkin myself. The West Wing is one of my favorite TV shows and The Social Network was one of my favorite movies of the past few years. I haven’t seen Unforgiven, which I plan to check out soon, Thanks for commenting! Started watching this the other night but my internet connection went awol after 20minutes, i enjoyed it up till then! Interesting to read your thoughts, Tom Cruise’s character was beginning to grate on me after a couple of scenes. I’ll try and re-watch it at some point. Didn’t even realise that famous line was in it, shocking. Tom Cruise’s character was too over-the-top and they should have toned him down. I actually didn’t know the line was in it as well. Thanks for commenting.